The grave shrine of Aristonautes. Temple-shaped funerary monument, crowned by a pediment (h. 2.85 m.). 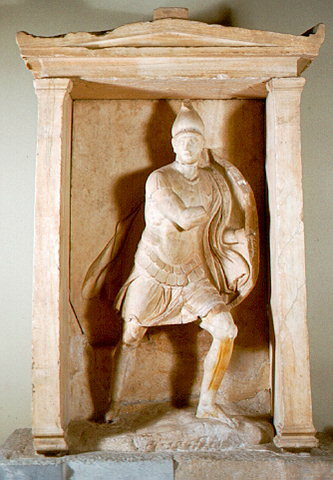 In front of the plaque, the figure of the deceased hoplite is represented in high relief. It was found at the cemetery of Kerameikos, in Athens. Dated to ca. 310 B.C. Inv.no. 738.